This is my newly finished little charm quilt wall hanging. Velma loves it, and I hope you do too. I used 1/2" Hexagons from Paper Pieces. Sometimes I am able to get them locally, sometimes mail order. The last time I did a mail order I added their acrylic templates - great for fussy cutting. Since this is a charm quilt, there are no repeats in the fabrics. This is a close up of the back, all trimmed and ready for layering. I plan to hand quilt this for an upcoming auction donation. I use thread basting to cover the papers, NOT going through the papers - I reuse my papers. No glue. This is the process that works best for me. Use what works best for you! I travel with these little jewels - great portable work. This is my backing fabric. You might recall I used this for the backing on my Calico Paradise quilt. I almost did a bar backing. Maybe on the next one. I have a second one half way done and lots of up coming travel. I'm off to press, layer and start hand quilting my reproduction fabric charm quilt. While I hand quilt I will contemplate the binding fabric. I am just back from Penn Dry Goods Market. The event is held annually at the Schwenkfelder Library and Heritage Center. It was a fabulous event and I am already looking forward to next year. It is held the same weekend in May each year. I only attended four lectures this year, but plan to enroll in more next year. Touring the exhibit hall was wonderful, as were the many vendors. 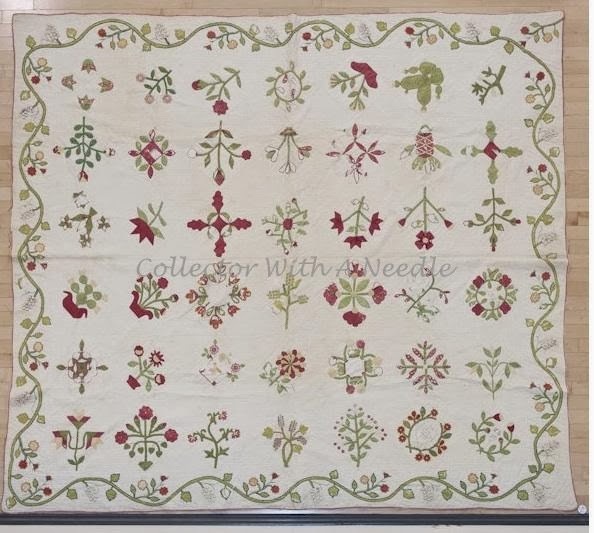 This quilt top is an exquisite collection of fabrics dating from 1830 - 1880. The central house block is surrounded by a sidewalk, basket blocks and a variety of scrap piecing. See the moon in the night sky? The display cases held numerous sewing treasures. Many of the pieces had full family history from Montgomery County PA. The antique dealers at the event had goods for sale of museum quality. Great marketing strategy after viewing the museum collections you could go purchase an antique of your own. New to me was a horse bonnet. At the gallery talk we learned while pretty, they were very useful. They functioned to keep flies off the horse. 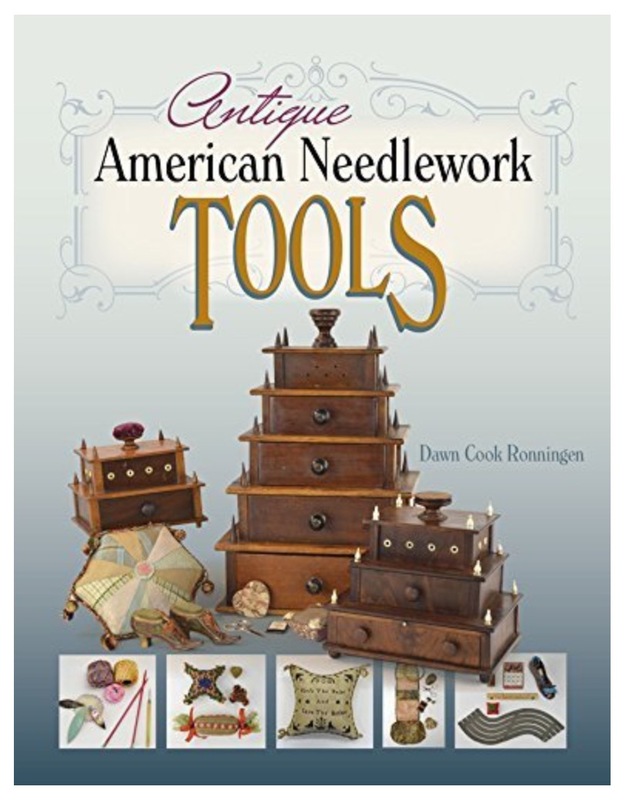 Available through the Sears catalog, if the homemaker did not crochet one herself. Search online for several patterns still available today. Yes, I did see an antique one for sale. As I recall it went for around $125. One of the lectures I attended was about the sewing books made by students of the Female Model School, Kildare Place - Dublin Ireland. Kathleen Staples brought examples I was unable to photograph. The girls learned skills in reading and sewing making scale size sewing samples. These are not doll clothes. First half of the 19th Century. After the three day event I spent a couple days antique shopping in the area. I'll share those treasures in a future post, right now I need a nap! You can search the wonderful Schwenkfelder collection of treasures HERE. Model School sampler removed from book and framed HERE. Kildare Place Society and School HERE. I finally made it to the Rocky Mountain Quilt Museum to see their new exhibit. "Quilting Past, Present & Future"
Quilts from Front Range Contemporary Quilters with quilts from the RMQM Collection. This is a detail picture of the Whole Cloth circa 1800 quilt. Home woven linsey-woolsey fabric with - linen warp and woolen weft. Of course hand quilted, beige/tan backing. My picture does not do it justice. Turned edge, no applied binding. I'm not able to show the entire exhibit, or how the old and new quilts are paired. I'm showing the quilts I enjoyed the most. "I manipulated my photograph of a white iris by increasing the saturation and zooming into the part of the flower a bee would see. Perhaps the bees see colors like this and it gives them a target visible from a great distance." Not only are the colors beautiful, the machine quilting was very complimentary. You can see the green is faded. "A modified version of the traditional cats cradle repeating quilt pattern holds two lynx in comfort. Applique is used to create a recognizable animal and tell a short story." "In the center panel, chain stitch embroidery reads Coralee Walters born March 29 1885 died March 19 1894 and other names, including Henry Edwards." "The outer panels contain embroidered symbols, some of which appear to be Masonic, Creole and African. 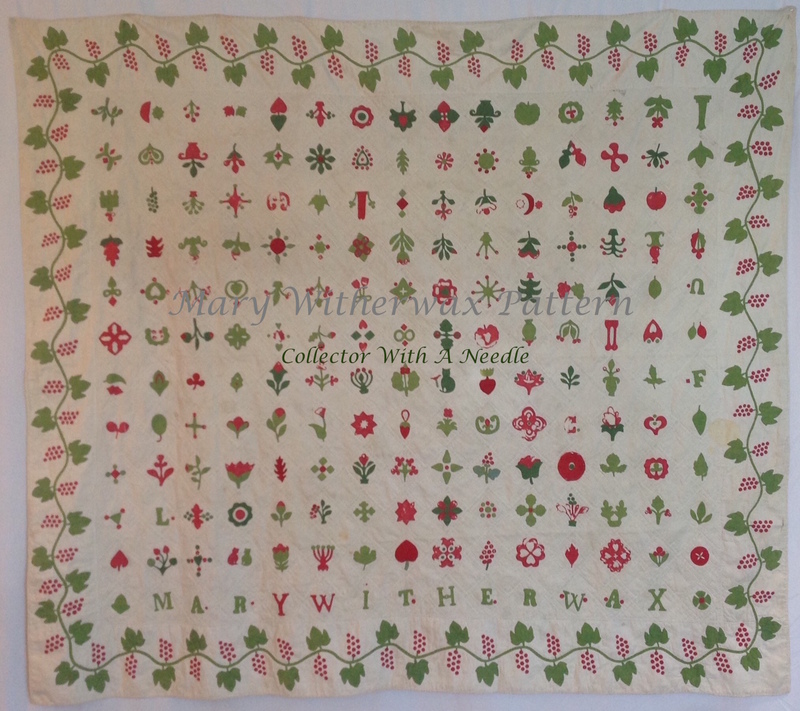 The orientation of the symbols, which can be read from either side, suggests this quilt may have been a coffin cover." "Creation Story" is the contemporary paring with Coralee's quilt. "Coralee's Mourning Quilt text was the main inspiration, and I similarly commemorated an event of importance by telling the story. Rather than embroidered lettering, mine is computer-generated and printed, along with photos for punctuation, technology not available to the original quilt maker. Secondary inspiration was experimenting with shapes using contrast, not color." "This quilt contains over 37,000 pieces, all sewn together by HAND. Fabrics include feed sack and scraps dating from the late 1800's. RMQM purchased the quilt from the makers grandson. The maker was said to have one of the largest button collections in Michigan." So many pieces my photo does not capture the beauty of this hand stitched quilt. The back of Quilt of Many Colors - Yes! It is hand quilted. "The bright blue and tan fabrics are likely from the 1850's. Many of the fabrics are faded due to unstable dyes." Detail of the hand quilting. "This quilt is believed to be Mennonite. The backing fabric is blue and white homespun cotton." Showing the tag so you can see the layout and position of the fabrics. This bed cover was exhibited folded. One more early chintz quilt? OK, glad you stayed with this post. The exhibit is open through July 29, 2014. This post doesn't include every quilt in the exhibit. 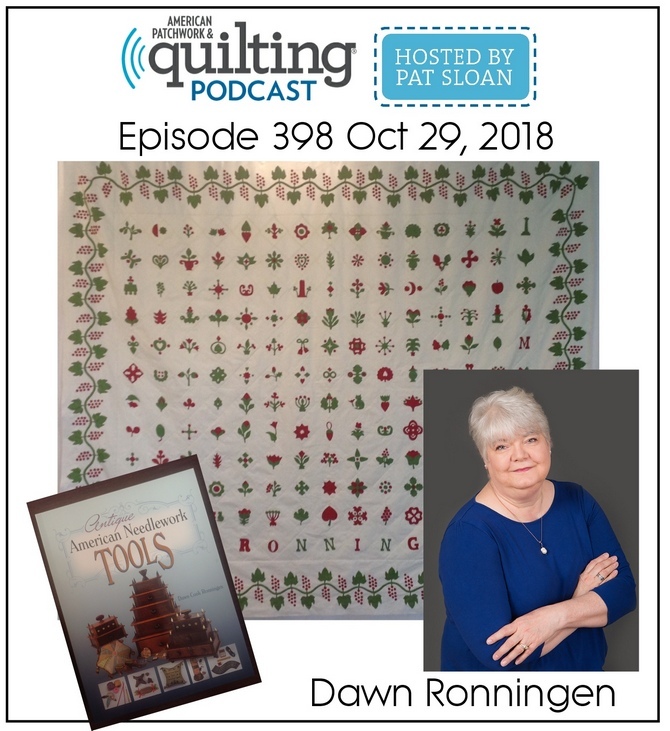 I hope you enjoyed the quilts! Could you choose a favorite?